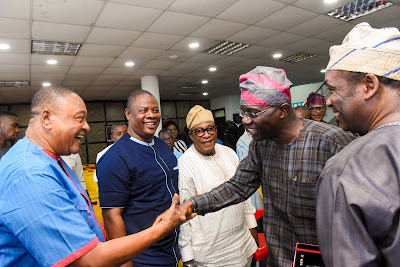 The practitioners who include Prince Jide Kosoko during a solidarity visit to the APC candidate and his deputy at their campaign Ikoyi office promised to mobilise their fan base and the general populace to vote for Sanwo-Olu because of his capability and experience. “I am very happy to see many of you here in flesh and blood especially our veterans like Oga Jide Kosoko and Oga Bello. Those days before the age of internet when we see you on television we look forward to meet you. You inspired us and entertained us. While speaking at the event, Dr. Hamzat also reiterated the significance of the creative economy and Lagos as the centre of entertainment in Africa.